Building a new home is exciting for the whole family. While mum and dad will undoubtedly love our open-plan kitchen designs and social alfresco dining areas, the young ones, too, have a lot to look forward to. 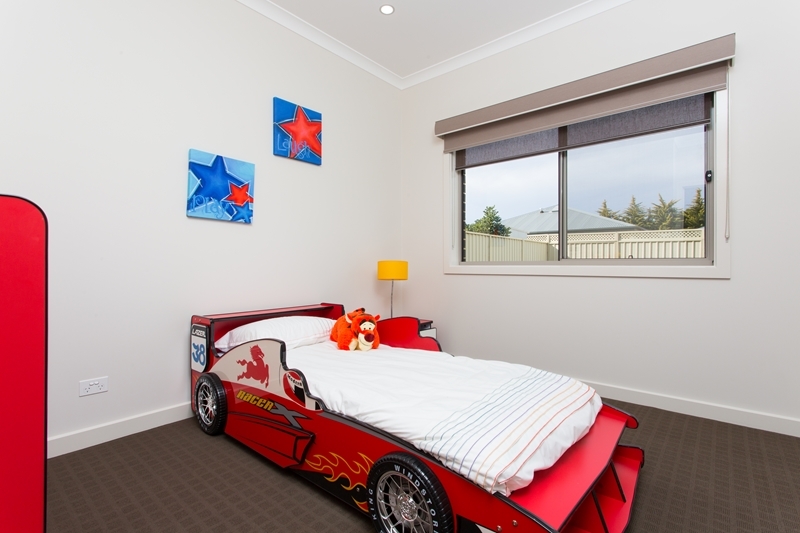 A splash of colour and a racing-inspired bed can turn a bedroom into a fun kid's space. As any parent can tell you, children are messy little creatures. As such, opting for delicate fabrics is usually a bad idea, as sticky fingers will make short work of such fragile surfaces. Instead, as House and Garden Television suggested, go for hardy materials that have been engineered to withstand challenging conditions. Wipeable paint, for example, can help keep the walls looking fresh, even when exposed to the most curious critters. Freestanding lamps and towering bookshelves look beautiful in your new home, but they're best used in areas where you'll be able to keep an eye on the little ones. This is particularly important when you consider that falling objects are one of the leading causes of injury to children, according to KidSafe South Australia. Decorate the room with lightweight plastic furniture and fittings to minimise the risks. Consider the effect your colour choice might have on your children. In years gone by, children's rooms were characterised by an unsightly jumble of bright, glaring tones. However, as we've developed a stronger understanding of the role colour has to play in our lives, people are realising how it can affect our moods. For instance, as home design experts Houzz explained, a red room can excite its occupants, while some shades of green, pink and blue have calming, soothing qualities. Guess who'll be spending the most amount of time in your children's room? That's right, your kids. As such, if they're old enough, let them have a say in the features they want in their space. Young avid readers, for example, may want easy access to their books, while arts and crafts fans may like to have their colouring pencils handy - you did go for the wipeable walls, didn't you?